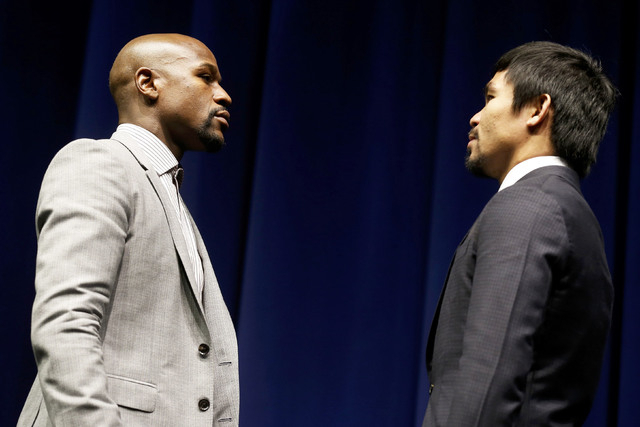 Officials apparently underestimated the take for the May 2 megafight between Floyd Mayweather Jr. and Manny Pacquiao. The original estimate was for $200 million in revenue, but Top Rank chairman Bob Arum says revenue will be closer to $400 million and the live gate will exceed $70 million. Is it possible everyone in boxing underestimated the earning potential for a fight between Floyd Mayweather Jr. and Manny Pacquiao? The original estimates of the fighters splitting $200 million and the live gate topping $40 million at the MGM Grand Garden when Mayweather and Pacquaio finally meet in the ring May 2 have been revised. The new numbers, according to Top Rank chairman Bob Arum, who promotes Pacquiao, are closer to $400 million in revenue with the live gate exceeding $70 million. According to the terms of the contract, Mayweather is to receive 60 percent of all revenue generated with Pacquiao to receive 40 percent. Sky Sports announced Tuesday that it will show the fight on pay per view in the United Kingdom and parts of Europe. 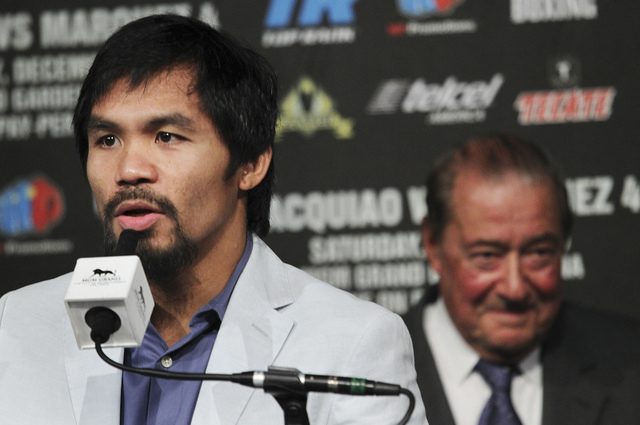 Arum said the foreign TV rights alone are worth approximately $35 million. The corporate sponsors, led by Tecate beer, are bringing in an additional $10 million. The fight is expected to be shown on closed-circuit television at select MGM properties on the Strip. The prices and locations have not yet been announced. Traditionally the closed-circuit TV announcement comes after the fight sells out in the arena. 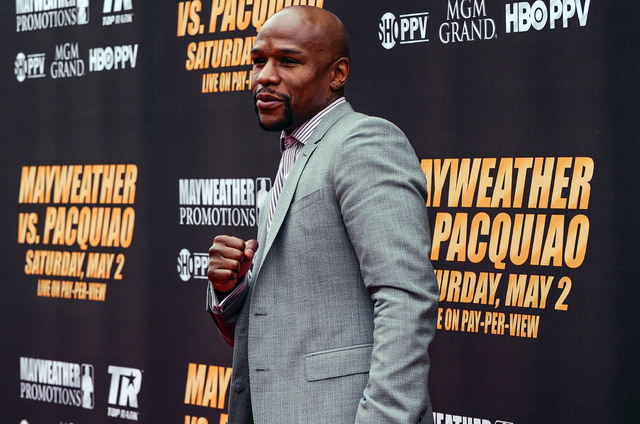 In the past, 20,000 to 25,000 seats have been made available for closed-circuit telecasts involving Mayweather or Pacquiao with a ticket price of $50 to $75. For this fight, expect double the capacity and double the price. If the MGM sells 50,000 closed-circuit seats at $150 per seat, that’s an additional $7.5 million in revenue. As for the public sale of tickets, the reason for the delay on announcing a date to purchase seats is because MGM officials are still trying to find more room inside the Grand Garden to add seats. Capacity for boxing at the Grand Garden, which is normally around 16,000, is expected to be just shy of 17,000 on May 2. And with ticket prices ranging from $1,500 for the upper portions of the arena to $7,500 for a ringside seat, the fight has a Super Bowl feel to it in terms of demand. Mayweather holds that record, his September 2013 fight with Canelo Alvarez generating a gate of $20.03 million. But the most fascinating financial perspective is the pay per view buys. Showtime and HBO are collaborating on the production and broadcast of the megafight and the price is still being negotiated with the numerous cable and satellite systems. Depending on what the final price is, the revenues could be even higher than projected. Many believe the price will be around $100 to purchase the PPV. But it could be higher. The record for PPV buys is also held by Mayweather along with the revenue for a PPV fight. Mayweather’s 2007 fight with Oscar De La Hoya had a record 2.44 million buys. 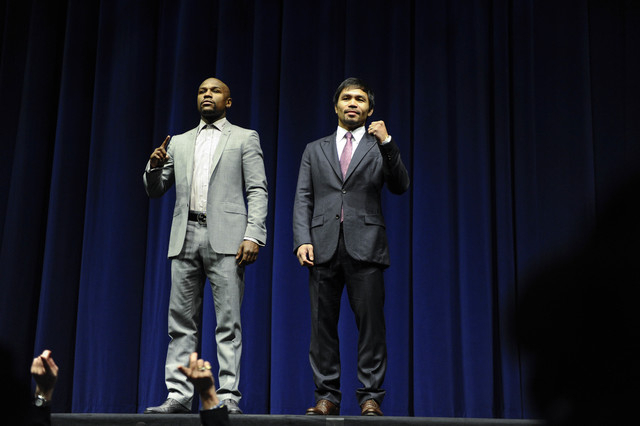 The Mayweather-Alvarez fight in 2013 set a record with $150 million in overall revenue. 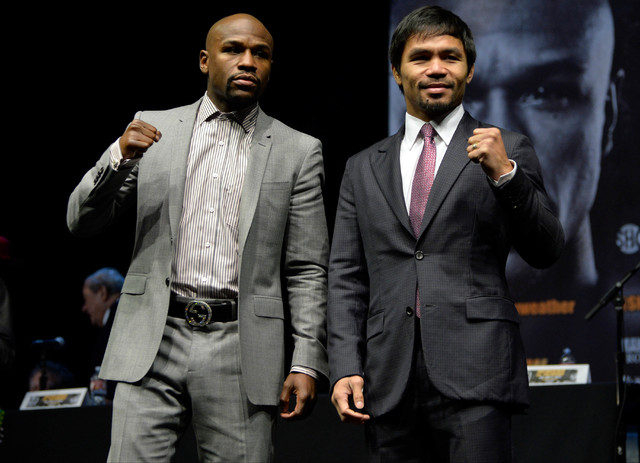 Given the projected numbers for May 2, was it smart to wait six years for the Mayweather-Pacquiao fight to materialize?